Your vehicle’s paintjob is quite vulnerable and should therefore be protected from elements like grit or salt that could result in minor damage. In the current market, most people opt for tailored waterproof canvas car covers. The work of these covers is to offer your car’s interior and exterior protection from pollutants or any damage. Taking good care of your car is essential especially if you choose to protect the re-sale value. When the car is protected, its good condition lasts as long as possible. This forms a first impression for anyone willing to buy the car. Moreover, taking care of it assures you of barely any repair work which is very much worth avoiding. Car covers can however turn out to be very frustrating especially when you are trying to fit them onto the desired car. In the long run, they end up consuming so much of your time. This is hectic for most drivers. How important are car covers and how frequent should they use them? If at all possible, the car cover should always be fitted onto your car anytime you are not using it. However, this might not be practical for some drivers. Before you decide to use a car cover, there are a few considerations you should have in mind. The placement of your car when you are not using it is extremely important. If for instance you live in an area with many birds or if you place your car under a tree, using a car cover should be inevitable. Bird droppings or other stuff falling from tress can cause serious damage to your car’s paintwork and hence the need for a car cover for protection against such. If you happen to park your car along a busy road, a car cover will prevent flicked up stones or grit from interfering with the paintwork of your car. Leaving your car exposed to direct sunlight for some time might cause some fading to the paintjob or damage the inside of your car. If your seats are made of leather, frequent exposure to direct sunlight could cause fading and cracking. A cover would come in handy in this case. When you get into a car that has been standing in the sun for a while without a cover, it becomes very uncomfortable to drive or be driven in it. If covered, the inside of the car remains cool and the driver or the passenger has nothing to complain about. Car covers discourage a thief’s true motives since it would be a big hustle having to deal with the cover before accessing the interior of the car. 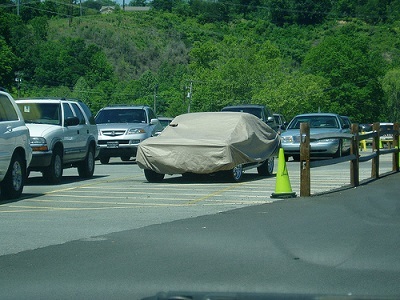 A car cover is a disguise especially if you have to leave you luxurious car in a secluded area. Always consider the model of your car since repairing the bodywork might be tricky. If the paintwork of a classic car is damaged, this will cost you a lot to just repair. If you do not plan to use your car for a while, not covering it might result in accumulation of dust in the moving parts. Moreover, a cover protects your car from rainfall or dampness and will often protect your car from harsh temperatures.